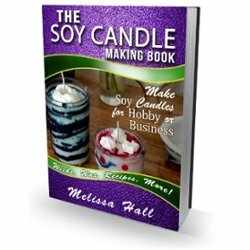 Would you like more exposure for your soy candle business? 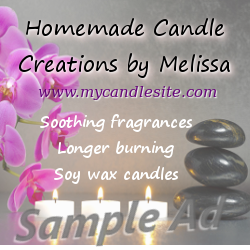 I am now offering a directory and ad spots for candle makers. Please see details and pricing below. What you get: You get a full page listing with up to 6 photos and 2000 character limit. I will also post a link to the directory on all my social media sites once a month. You will write up your description and send me your photos and I will set up the page. Photos must be kid friendly. Please allow up to 48 hours to set up your listing. *There are limits on the types of photos I will allow in the directory and ads. I know that some candle makers like to use beer bottles to make candles with. I do not allow the promotion of alcohol, so I don’t allow pictures of candles that have labels of some sort of alcohol on them (I don’t believe you can legally sell them with the labels on anyway). I am sorry if this limits some from being able to be added to the directory, but I have a standard I want to uphold for this website. Thank you for understanding! Please Read: There are no refunds on ads, ad creation or directory purchase once the ad and/or directory listing is posted. Monthly subscriptions will be charged automatically until you decide to cancel. If you decide to cancel your subscription, cancellation must be done before the next monthly charge. I do not give partial month refunds. You get a 250×250 ad shown on the sidebar of all pages of the website, except for the home page. 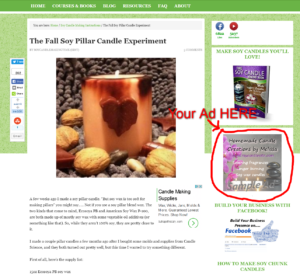 Your ad will be linked to your website/store or social media page. You create your ad and send to me for approval. Ads must be tasteful and kid friendly. You will also get the directory listing as shown above. 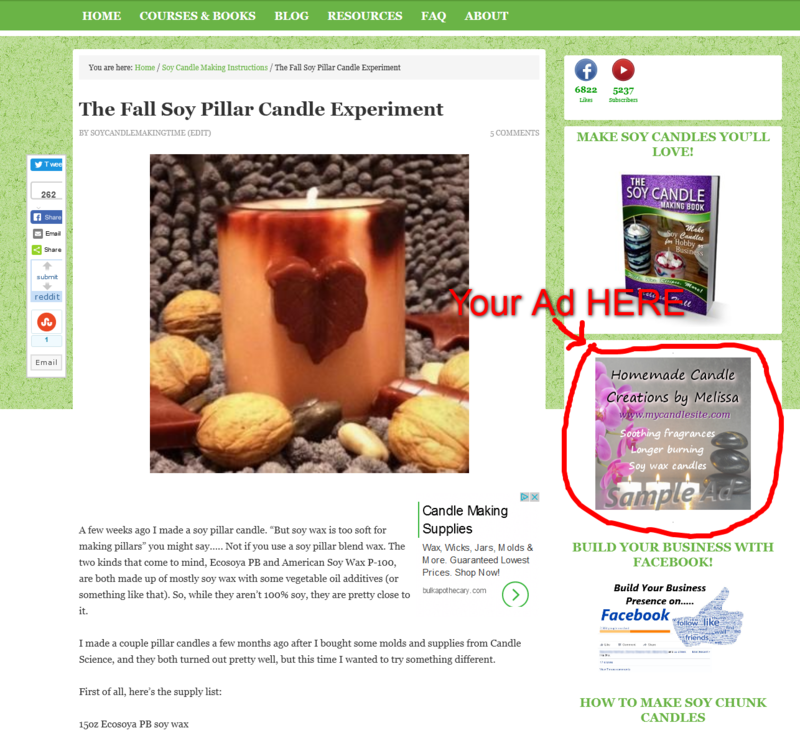 If you want me to create your ad for you, please scroll down for details. Please allow 2 days for ad and directory set up after I receive your ad image and directory information. Your ad will rotate with up to 2 other ads every 6 seconds. If you would like me to create the ad for you, I can do it for a one time fee, and you get to keep all rights to the ad image to use as you wish. If you have an image you would like me to use, please email me after purchase. Please allow one week for ad creation and setup on the website.